O.M.A.C. : I was first introduced to the One Man Army Corps in DC Comics Presents #61 (cover dated Sept’83), when Superman teamed up with the mohawk-sporting crusader. It was the second DCCP issue I picked up off the rack and featured George Perez on cover and interiors (I’m sure that added to my enjoyment). From there, John Byrne gave us the 1991 4-issue OMAC mini-series (which was probably the high point of Byrne’s art for me). After that, I wouldn’t read of the concept again until Geoff Johns and company used elements of OMAC’s mythos for the lead up to Infinite Crisis. The New 52 version of the character was a fun romp – even though it only lasted 8 issues. Researching for this post, I just discovered that there was an OMAC back up in the original Warlord series. So I have that and the original Kirby run to look forward to if I want to read more of this fun crazy character. CELESTIALS: I’m not entirely sure where I read of these characters first – maybe the Official Handbooks? Or Avengers? The 80s Silver Surfer series? Not sure. But I do know it was Earth X and the way Alex Ross and company handled this concept that made me latch on to these cosmic beings. They even get some play in the Hickman SHIELD series, beautifully drawn by Dustin Weaver. I’ve only read a few issues of Kirby’s original Eternals series – but the way they have been intertwined into the Marvel Cosmology is fascinating to me. KAMANDI THE LAST BOY ON EARTH: Just like OMAC, I’m fairly certain my first Kamandi appearance was in DC Comics Presents #64 (cover dated Dec’83) written by Mark Evanier. I imagine many of Kirby’s concepts were slowly starting to make their way into the regular DC Universe in the early 80s. The Super Powers mini-series were out of continuity – and it would take the Legends event to fully integrate the New Gods into the DCU – so these one off appearances were all I had at the time. Eventually Kamandi and the Great Disaster were melded into the Tommy Tomorrow history (at the end of Crisis) but the character would still pop up here and there, most notably in the Wednesday Comics strip by Dave Gibbons and artist Ryan Sook. KANG THE CONQUEROR: Probably one of my favorite Marvel villains – for his look, his modus operandi, his convoluted origins, for his role in Avengers Forever and probably because I love time travel/alternate history stories. The guy’s got some swagger. PROMETHEAN GIANTS: This is a Kirby concept that originated in the early New Gods run, but expanded in design in the Uncanny X-Men/New Teen Titans crossover oneshot by Chris Claremont and Walt Simonson. 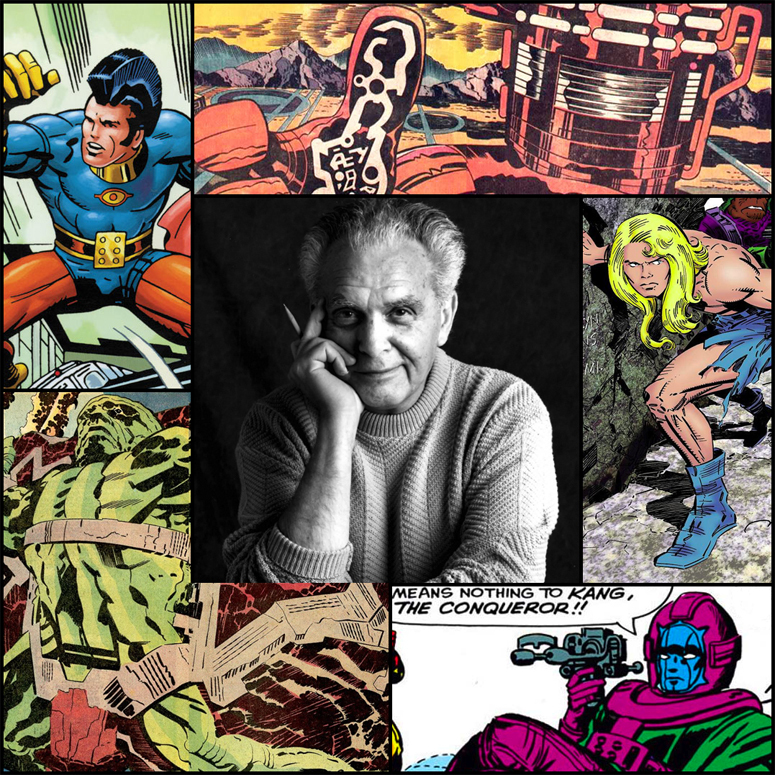 Kirby referenced the Promethean Giants and the Final Barrier to the Source, but it was Claremont and Simonson and company that gave the great wall its definitive look. Still, without Kirby, this insane concept – of a barrier that absorbs those that try to breach its wall and the secrets that are held beyond – wouldn’t have been formed. It’s always fun to see other artists’ interpretations of this cosmic monolith. Beyond these characters and concepts, I should probably also give a nod to the Enchantress, the concept of Galactus’ heralds, Kirby dots, Kirby tech, Metron and the X-Men.